What you see on the outside only scratches the surface of our lives. Our stories make us different. Our stories bind us together. And, it takes a thousand voices to tell the whole story. Join us on August 16 to hear a selection of those powerful voices as Principal® partners with the Facing Project to create awareness of disabilities in the workplace and to help foster understanding. The Facing Project is a nonprofit organization that connects people through story. Principal® is proud to be the first company to collaborate with the Project to gather narratives about unseen issues that challenge the balance of work and life. Don’t miss this opportunity to help spark a conversation about diversity and inclusion in a space where it's OK to ask. The Roundtable is currently at capactiy, please email Molli Davis to be put on a waiting list. 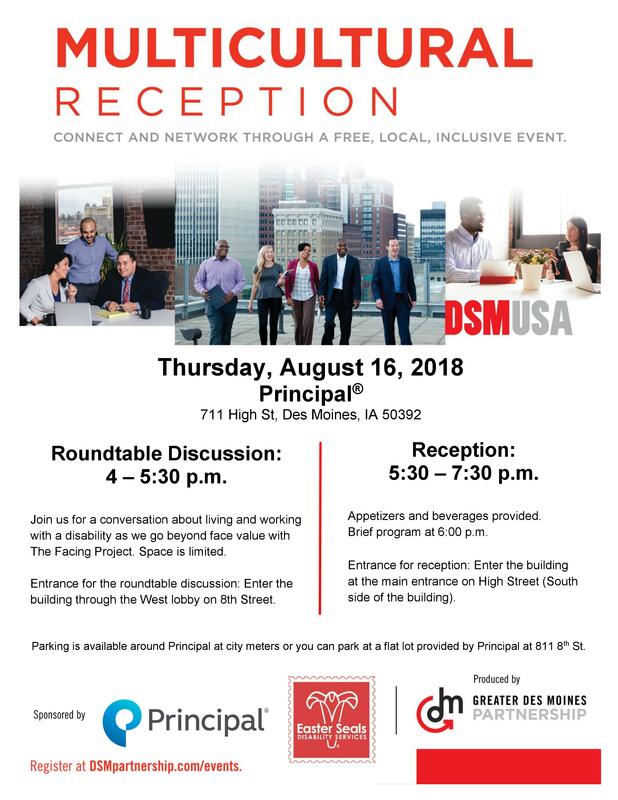 Join us for a unique social opportunity to connect and network with a broad range of professionals, community leaders, and organizations with a Diversity focus fostering an environment of connectivity and inclusion. Brief program at 6 p.m. Appetizers and beverages will be provided. Please note that space is limited for both of these events. For Roundtable Discussion, enter the building through the West lobby on 8th Street. For Multicultural Reception, enter the building at the main entrance on High Street (South side of the building). Parking is available around Principal® at city meters or you can park at a flat lot provided by Principal® at 811 8th Street. Roundtable: 4 - 5:30 p.m. - The Roundtable is currently at capactiy, please email Molli Davis to be put on a waiting list. Multicultural Reception: 5:30 - 7:30 p.m.